빅토리아주에서 살다보면 &ndash 물론 다른 주도 마찬가지겠지만 – 전기나 가스를 교체하라는 영업사원들이 집으로 종종 방문한다. 자기네들이 가장 경쟁력있는 가격을 제시할 수 있다면서… 사실일 수도 있고 아닐 수도 있다. 그걸 위해서 빅토리아 주정부는 아래와 같은 사이트를 통해 소비자들이 직접 비교하고 선택할 수 있도록 했다. 위 사이트에 접속해 보면 본인 거주지의 우편번호만으로 어떤 전기/가스회사의 서비스를 이용할 수 있는지 알 수 있다. Toastmasters club is one of well known English speech clubs in the world. It spreads out all over the world, even in Korea. There are, of course, hundreds of toastmasters clubs in Melbourne. Well, eventually I went to the meeting today. I chose one of clubs nearest from my office. Before getting there, I was very nervous and nail-bitten. "What will happen if I’m not able to get understood? ", "How can I jump in their chatting? ", "I might say nothing in the meeting." It was, however, just an unnecessary anxiety. Members in the club was so supportive and constructive to each other. Today, there were four guests, including me, joining this meeting. The meeting took an hour and all events were progressed in timely manner. Basically, toastmasters meeting is all about speech. All participants are advised to give their speech in a given time. From opening speech by today’s toastmaster via five to ten minutes main speech with given topics, impromptu (on the spot) speech of 90 seconds, and evaluation speeches to closing speech, all activities in the meeting were conducted by speech. As a guest, even though I didn’t have to participate in a speech, I also delivered a short address with a given theme for just a 30 seconds or slightly longer. I am confident with giving public speeches in Korean resulted from lots of experiences. However, English speech is another thing because it’s not my mother tongue. Well, even though it was just a very short address, I was encouraged to do so and, I believed, I coped with it. Another thing I was interested in is that there are other roles involving the meeting, other than speakers. Evaluators point out what speakers did well and what they need to be improved such as gestures, tones, voice vibrations, eye contacts and so on. A Gruntmaster checks what participants did unnecessary things like wrong gestures, "ah~" sounds and so on, which are actually avoided while giving a public speech. A Harkmaster checks how much extent participants courteously listened to the speech by asking five to ten short quizzes based on the speeches. A Time-keeper counts each participant’s speech time by a stop watch. According to the manual, there are other roles to go the meeting seamlessly. My first impression about the meeting was that all members in the meeting today liked to listen to others, give humours during their speech, which is fantastic, and be very reactive. The second feeling was that they didn’t evaluate the topic of a speech but do evaluate the structure of the speech, and provided constructive feedbacks immediately. Maybe I’ll get tens of feedbacks after my first speech soon, but it should be my opportunity to get myself improved. The last impression was that they had no hesitation with the impromptu speech. The questions for the on the spot speech were not easy to convert their thoughts to a short speech immediately. However, they successfully dealt with them, which would be very useful for job interview skills. I’ll have another club meeting next week and make a decision which club to join – maybe both. The purpose that I join in the club is improving my communicating skills. I have no idea if it would be successful or not by taking part in the club. However, I’m sure that it’ll get me out of uncertain fear of speaking in English. Even in winter, the temperature in Melbourne doesn’t go down below the zero degree. In other words, we can’t see any ice or snow in Melbourne in winter. 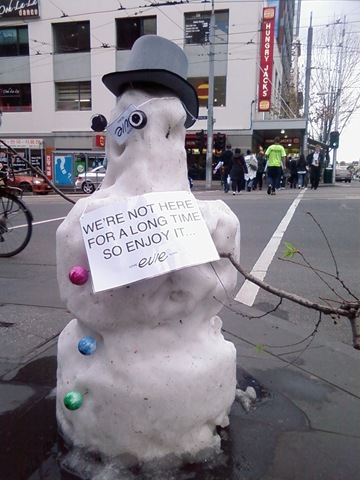 This morning, at the corner of Swanston Street and La Trobe Street in Melbourne CBD, someone built the snowman!! What a surprise!!! Even though it’s deployed just for a promotion purpose, it’s good to see you again, snowman! According to the newspaper article, a new scoring system called Australian Tertiary Admission Rank (ATAR) will be introduced to all States except Queensland. ATAR is similar to Equivalent National Tertiary Entrance Rank (ENTER) in Victoria and Universities Admissions Index (UAI) in ACT and NSW, and Tertiary Admissions Rank (TAR) in SA and TAS. Only the difference between UAI and ATAR is the maximum score. UAI has its maximum score of 100, while ATAR and ENTER has 99.95. Therefore, Victorian Year 12 VCE students will not worry about changing the scoring system from ENTER to ATAR because it will be basically the same as each other. If VCE students or their parents or guardians want to know how to calculate ENTER score, this link – ABC of Scaling – might be useful. 퀸즐랜드를 제외한 모든 주에 공통으로 적용할 수 있는 새로운 대학수능시험 점수 산정방식을 도입한다고 한다. ATAR 이라고 불리는 이 점수 산정 방식은 우선적으로 ACT 와 NSW 주의 12학년 학생들을 대상으로 적용하는데, Victoria 주는 기존의 ENTER 산정 방식과 거의 비슷하기 때문에 그닥 큰 영향을 받지는 않을 듯 싶다. I won’t say anything about what he did on 23th of May, but I’d like to show my respect and memory to him, regardless of my political stance. There are two memorial places voluntarily organised in Melbourne. If anyone interested in visiting, please do so. 멜번에도 노무현 전대통령을 추모하는 분향소가 생겼다고 한다. 나의 정치적인 입장과는 상관없이 한나라의 대통령이었던 분께서 죽음이라는 선택을 할 수 밖에 없었던 것에 대해 애도의 마음을 표한다. 멜번지역의 분향소는 위의 두군데가 있다. 모두 자발적으로 진행이 되고 있는 곳이다. 한 곳은 브라이튼에 위치한 불교사원이고, 다른 한 곳은 멜번시티에 위치한 한국 식당이니, 멀리서나마 추모의 마음을 전하고 싶은 분들은 꼭 가보시라. Well, my mother-in-law has been staying with my family for already two weeks. Sean, my upcoming second son, is not born yet, so we’re going to Mt. Dandenong tomorrow to go for a walk around the mountain area. In order to get there from my place, we have to pass the Belgrave train station where Puffing Billy Steam Train is also run. So, I looked into the website if the train is running tomorrow or not because it would be possible that the train would not run due to the bushfire happened before. Well, as I guessed, number of schedule for train running has reduced and, even worse, the train would be substituted with diesel locomotives to avoid possible accident. Oh, no~. How disappointing~! We have to wait for the steam train until everything comes back to normal. As an alternative, we’re going to have a barbie at Grants Picnic Ground, as well as bird watching.